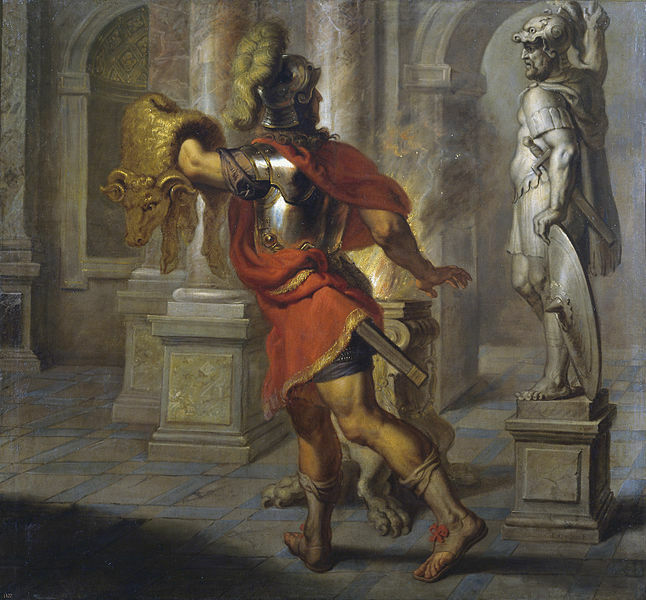 The story of Jason and the Argonauts is one of the most famous stories to come out of Greek mythology, and of course the heroes were tasked with the capture of the Golden Fleece of Colchis. ​The Golden Fleece of course originally came from a Golden Ram, the Crius Chrysomallus, and of course there is a Greek myth about the Golden Ram as well as the Golden Fleece. The story of the Golden ram begins not in Colchis but in the kingdom of Bisaltia upon the northern coast of the Aegean Sea. The king of Bisaltia was Bisaltes, a son of Gaia (Goddess of the Earth) and Helios (the god of the Sun), and thus the kingdom, and its people, the Bisaltae, was named after the king. In Greek mythology, the most important aspect about King Bisaltes was the fact that he was father to a beautiful daughter, Theophane; and suitors from across the ancient world would flock to Bisaltia in an attempt to wed Theophane. In Greek mythology, a beautiful woman would not simply attract mortals, and in the case of Theophane, it was the god Poseidon who lusted after the princess. Poseidon decided that in order to have his way with her, he would abduct her, and so Poseidon and Theophane were soon on the island of Crumissa. The disappearance of Theophane caused a stir in Bisaltia and soon the suitors left behind were on the trail of the daughter of Bisaltes. To confuse the chasers Poseidon transformed himself into a ram, and Theophane into a ewe, whilst the inhabitants of Crumissa were changed into cattle and sheep. When the suitors landed upon Crumissa they found no Theophane and no people at all. The suitors did not leave the island immediately though, and set up a camp for themselves, and then to sustain themselves, they commenced to eat the animals that they found on the island. Poseidon then decided to transform the suitors of Theophane into wolves. 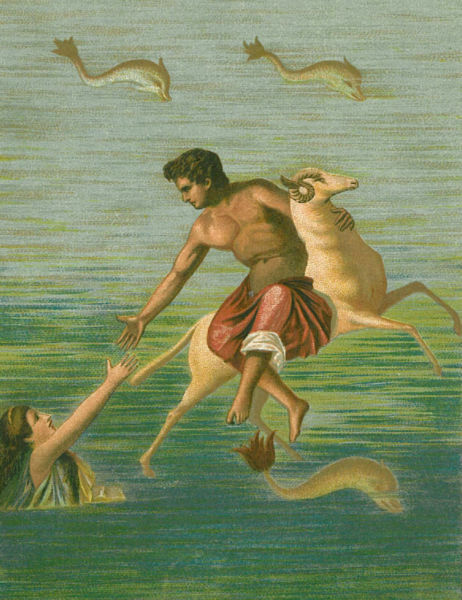 Poseidon was then able to have his wicked way with Theophane at his leisure; the brief relationship between Poseidon and Theophane would produce one child, a golden ram, the Crius Chrysomallus. Later, the Golden Ram would find that it had an important role to play in Greek mythology, and the story shifts to Boeotia. In Boeotia there was a king called Athamas, a son of Aeolus, who had wed the cloud nymph Nephele. Nephele would give birth to two children, a son called Phrixus, and a daughter named Helle. The relationship between Athamas and Nephele was destined not to last though, and Athamas would ditch Nephele in favour of Ino, a daughter of Cadmus. Nephele would leave Boeotia, leaving her two children in the care of their father; Nephele would also leave behind a draught, although whether this was caused by the departure of the water nymph or the intrigue of Ino depends on the version of the myth being told. Certainly Ino was jealous of her two step-children, and she even went so far as to try and kill Phrixus. The murder of Phrixus though was to be done in a roundabout way, for through bribery of various messengers, Ino convinced Athamas that the Oracle had proclaimed that only through the sacrifice of Phrixus could the draught be lifted. Nephele might have left behind her children but she had not abandoned them, and before Athamas could even consider sacrificing his son, Nephele had dispatched the Golden Ram to rescue the Phrixus and Helle. The Golden Ram had been born with many special characteristics, and not just the colour of his fleece, one special trait of the Golden Ram was its ability to fly, and soon the Golden Ram was flying from Boeotia with Phrixus and Helle clinging to its fleece. The plan was to fly to Colchis, the kingdom on the furthest coast of the Black Sea, and the very edge of the known world, putting as much distance between the children and Ino as possible. The flight was obviously a long one, and being not as strong as her brother, Helle struggled to stay upon the back of the Golden Ram. Ultimately, Helle would lose her grip upon the Golden Ram, and the daughter of Nephele fell to her death at the narrow entrance to the Black Sea. Where Helle fell would subsequently be known as the Hellespont, a name that the Dardanelles, is still sometimes referred to. Phrixus would manage to hold on to the fleece of the Golden Ram though, and after a long flight, the son of Nephele would safely land in Colchis. Another of the special characteristics of the Golden Ram was its ability to speak, and thus it was the Golden Ram who told Phrixus what he must do next. Phrixus was told to sacrifice his rescuer, the Golden Ram, to honour the god Poseidon. Thus, the life of the Golden Ram came to an end, but in undertaking the sacrifice, Phrixus came into possession of the Golden Fleece. Poseidon would ensure that the Golden Ram would forever be remembered for the Crius Chrysomallus would be transformed into the constellation Aries. The story of the Golden Ram’s Golden Fleece of course continued, and Phrixus would carry the fleece into the court of Aeetes, the king of Colchis, and the king was then presented with the Golden Fleece as a gift by the son of Nephele. Aeetes was so taken by the wonderful gift, that Phrixus was promptly given the hand in marriage of a daughter of Aeetes, Chalciope, and safe from harm, Phrixus would prosper in Colchis. King Aeetes would subsequently place the Golden Fleece in an honoured position, for it was placed upon an oak tree in the sacred grove of Ares. 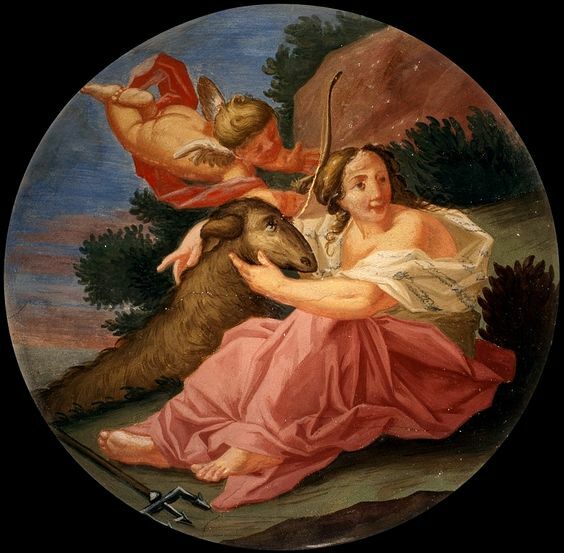 Although greatly enamoured by the gift, the Golden Fleece would subsequently prove a curse for Aeetes. Prior to the arrival of Phrixus and the Golden Ram, Aeetes had a reputation for being a hospitable king, but now a prophecy was made that Aeetes would only remain King of Colchis if the Golden Fleece remained with Ares’ sacred grove. Now fearful of his own position, Aeetes commanded that any strangers found within Colchis were to be put to death, for he feared that a stranger might steal the Golden Fleece. Far away in Iolcus, Jason had arrived and was attempting to gain the throne from his uncle, King Pelias. Pelias had no intention of simply giving up the throne that he had worked so hard for, and so instead promised to give up the throne if Jason came back with the Golden Fleece from Colchis. The quest given to Jason was a seemingly impossibly one, and one which Pelias hoped would kill Jason in the attempt to complete it. Jason was being aided by both Athena and Hera, and soon the Argo had been constructed and the greatest heroes of the age were at its oars. There were many adventures and dangers to face on the journey to Colchis, but in the end most of the Argonauts safely reached the kingdom of Aeetes. The strength of the Argonauts meant that Aeetes could not simply kill them, but the king of Colchis was not simply going to hand over his prized possession either, especially if it meant losing his kingdom. So, Aeetes decided to set Jason more impossible tasks, again with the intention of killing the Greek hero. Jason was tasked with yoking the fire breathing bulls of the king, and then he had to deal with the Spartoi warriors, sown from the teeth of a dragon. Again though Jason was favoured by the gods, and Hera had ensured that Aeetes’ sorceress daughter, Medea, had fallen in love with Jason. Aeetes still plotted against Jason and the Argonauts though, and the king was even planning to kill the heroes whilst they slept. Medea though warned Jason, and before the king could implement his plan, Jason acted. Medea and Jason went to the grove of Ares, and the sorceress managed to put the Colchis dragon, the serpent who guarded the grove, to sleep. Thus, Jason was free to remove the Golden Fleece from its perch, and flee back to the Argo. 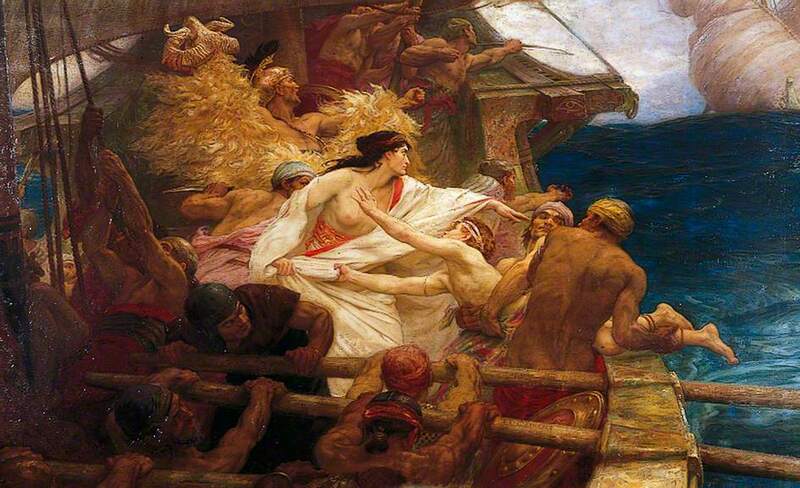 Jason, the Argonauts and Medea would therefore leave Colchis with the Golden Fleece safely on-board the Argo. The journey back to Iolcus was not without its dangers but eventually the Argo was once again anchored by the city of Pelias; and Jason present the Golden Fleece to his uncle. Pelias, even with the Golden Fleece now in his possession had no desire to make good on his promise, but for his treachery the king was eventually killed by his own daughters. Jason though never got to be king of Iolcus, for Pelias’ son Acastus succeeded his father and exiled Jason and Medea. As to what happened to the Golden Fleece was never made clear in the ancient sources, although other similar artefacts, such as the tusks of the Calydonian Boar, normally ended up in a temple dedicated to one of the major Greek gods or goddesses. The story of the Golden Fleece has evolved over the centuries though, and later stories connected with the artefact imbued it with healing powers, although in antiquity the Golden Fleece was simply a great treasure rather than a magical object.